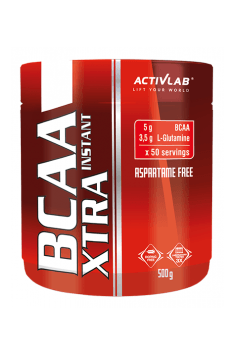 Activlab BCAA Xtra Instant is the highest-quality amino acid supplement, providing high doses of branched-chain amino acids (BCAA) and L-Glutamine. This product is characterized by excellent solubility in water and is very effective in covering the increased demand for branched chain amino acids, especially in people who perform strength sports. Branched chain amino acids have the ability to increase the use of fat as an energy source. Therefore, energy is obtained from triglycerides derived from fat cells. Thanks to this, the loss of fat tissue is faster and, what is important in conditions of increased protein demand – the body does not break down the proteins present in our muscles. BCAAs thus prevent the loss of muscle mass due to an insufficient number of calories in the diet. After an intense effort, we usually feel very exhausted. This can be partially reduced by supplying the right amount of carbohydrates before a workout – which will prevent drastic declines in energy after training. Another way is to take this supplement because branched chain amino acids have the ability to lower the concentration of tryptophan, which is a substrate for the synthesis of serotonin responsible for the post-workout fatigue. BCAAs, in particular, L-Leucine, which is the strongest branched amino acid, can significantly accelerate protein biosynthesis. This occurs by increasing the number of calcium ions bound inside the cell by calmodulin. It is a signal activating the mTOR complex that has the ability to intensify protein formation processes that are crucial for the proper functioning and structure of the muscle system. Like other BCAAs, leucine may also prevent muscle atrophy caused by various diseases and inhibit catabolism. L-Glutamine is the most abundant protein amino acid in our muscles. It is true that it can be synthesized by our body, but the need for this amino acid increases significantly as a result of physical effort. For this reason, glutamine supplementation is sometimes needed to get the best training results. It supports the building of muscle mass and promotes the renewal of glycogen resources. Glutamine as a protein amino acid is necessary for the synthesis of all proteins in the body. Similarly to Branched Chain Amino Acids (BCAAs), it can inhibit catabolic processes associated with insufficient glutamine supply. In people experiencing a lot of stress or struggling with various diseases, the demand for this amino acid increases significantly. Its supplementation helps to cover this demand and provide a muscle-friendly anabolic environment. L-Glutamine may in specific cases be a direct source of energy. It is transformed into such organic acids as pyruvic, lactic or lemon. These, in turn, may be included in the Krebs cycle from which ATP is formed or constitute a precursor to glucose in the process of gluconeogenesis. As a result, by stimulating the formation of glucose in the cell, glutamine contributes to faster replenishment of glycogen stores – to be later used as a source of energy for the work of muscle cells. Faster re-synthesis of glycogen facilitates the regeneration of muscles, so that they may be ready for another workout earlier. In summary, Activlab BCAA Xtra Instant is an amino acid formula that provides the supply of compounds that help to build good quality muscle mass. The branched amino acids and glutamine present in this supplement support protein biosynthesis and promote muscle regeneration after training. The product dissolves easily in water, making it extremely convenient to use. Take one portion (10g) 30-40 minutes before workout, second (10g) right after workout. Take one portion of 10 g before meal. BCAA brings the best results when used before and after workout – take the first serving about 30-40 minutes before training, and the second one right after training. That method with ensure the most efficiently that the damage of muscle fibres after workout is minimised and support provided for post-workout regeneration. In order to maximise energy levels for the time of training and reduce fatigue, BCAA can be combined with caffeine. All flavors: acidity regulators: citric acid and sodium citrate, color: ammonia caramel (flavor of cola), aromas, sweeteners: acesulfame K and sucralose, dyes: quinoline yellow (lemon flavor, orange, pears), orange yellow (grapefruit flavor, orange, kiwi ), cochineal red (grapefruit, cherry, black currant, blueberry, strawberry flavor) - can have a detrimental effect on activity and attention in children, brilliant blue (blackcurrant, blueberry, kiwi flavor).